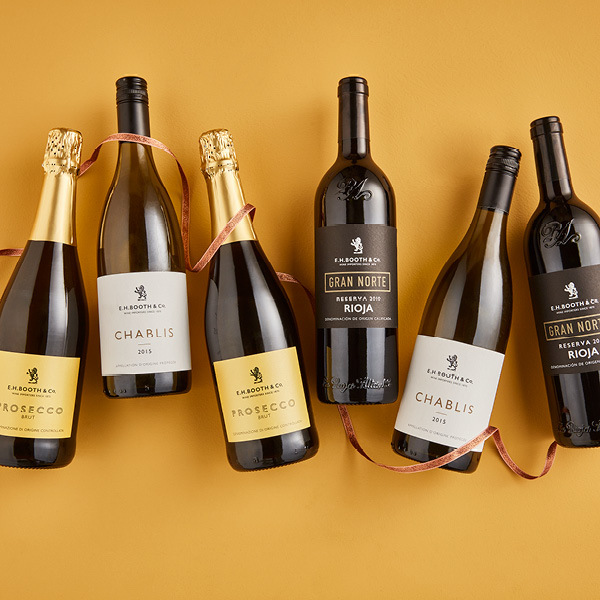 Fuel your festivities with this best-selling selection of our own label Booths brand wines. Booths Gran Norte Rioja Reserva – Made from 100% Tempranillo grapes and matured for 2 years in oak barrels, this is an expressive and elegant Rioja. Medium bodied with smooth tannins, it is dominated by notes of ripe red fruit, currants and liquorice, rounded off with sweet notes of vanilla and spice. Booths Prosecco – Made in the Veneto region of north east Italy. This is a fresh, delicate Prosecco made from grapes which are harvested at optimum ripeness. This ensures the perfect balance of Prosecco’s characteristic aromatics with a refreshing, zesty acidity. This fresh, dry fizz has fresh green apple and peach aromas followed by light and delicate citrus notes, making it ideal to serve chilled as an apéritif. Perfect on its own, or try with peach purée for the perfect Bellini, or a dash of bitters for a lively spritz. Delicious with grilled fish and seafood.